The sporty 2 1/2" Baseball Stadium Medallion series features highly detailed authentic stadium action in an antique gold finish with an engrave-able back. The athletes seem to burst out of the stars and stripes embellished victory "V", and give this award a real 3D effect. V Series resins are available in two sizes, and the bases can be personalized for your event. This award makes a budget friendly, unique recognition of excellence. 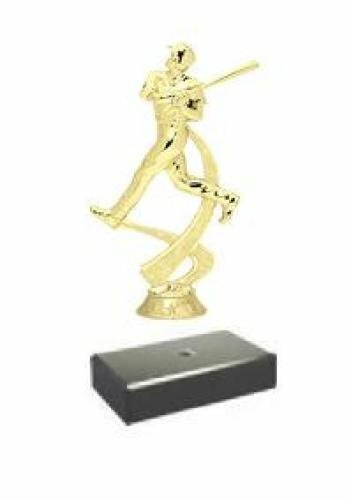 Two large shooting stars frame a batter about to hit one out of the park on this silver resin trophy. The base has a large space for a plate personalized for your event to recognize and honor achievement on the ball field. A cool new baseball figure on black or white marble!